The Old Barn is an existing converted farm building in the hamlet of Milby, just outside Boroughbridge. 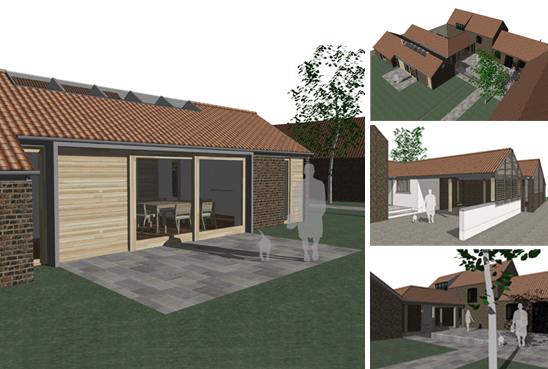 The project brief was two fold: to convert an existing outbuilding and carport to form a new guest annex to the main house; and to link the annex to the house with a new entrance hall and utility block, with a new covered double car port. The design aimed to respect the scale and form of the existing with a modern reinterpretation of the traditional farm building, reusing existing materials with contemporary detailing. The proposed extension took the form of an L-shaped pitched roof building which announced the new main entrance from one side, and enclosed the courtyard to the rear. The annex was designed to be self-contained and incorporated an open plan kitchen and living space, with an enclosed bedroom suite. To maintain privacy to the house and maximise views, windows opened to the landscaped gardens to the rear.